This Thursday and Friday, the campus community is invited to stop by 11 EmoryThanks locations, including the main station at Asbury Circle, to thank donors for their support by writing notes, taking photos and recording video messages. The second annual EmoryThanks, an opportunity for the campus community to thank Emory donors, will be Thursday, Nov. 9, and Friday, Nov. 10. Each school will also have its own EmoryThanks station, along with the Woodruff Library, Campus Life and Athletics. Each will have treats or prizes for participants. On Thursday, Nov. 9, the campus community is invited to stop by any of 10 stations, including one on the Oxford College campus. Due to anticipated inclement weather, the central EmoryThanks station with Emory College and the Michael C. Carlos Museum will be on Friday, Nov. 10, from 9:30 a.m. to 2:30 p.m. at Asbury Circle. Visit an EmoryThanks station to write notes, take photos or record videos thanking Emory donors for their generous gifts that contribute to Emory’s global and national reach through research, service, outreach and education. Received a scholarship or financial aid? Studied in the library or researched at the Carlos Museum? Downloaded an e-book from the library? Been to a doctor at Student Health Services? Attended a public lecture on campus? Then you’ve been impacted by Emory donors, and we want to hear your story! 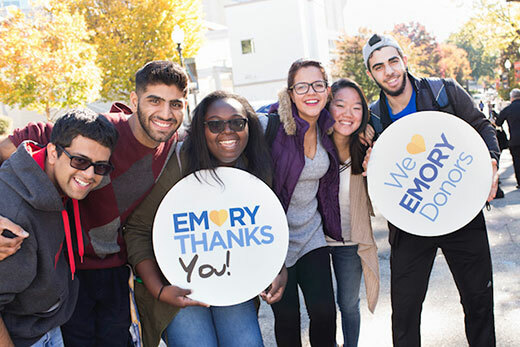 Students, faculty, staff and organizations can share their gratitude for Emory donors on Twitter, Facebook and Instagram using #EmoryThanks to be entered to win one of four $50 Amazon gift cards. Schools, units and organizations are encouraged to post on their own accounts using #EmoryThanks. The EmoryThanks Facebook and Instagram pages will be posting throughout the day. More than 90 percent of annual gifts made to Emory last year were less than $1,000. These gifts provided nearly $5 million in support. Approximately 70 percent of Emory students receive financial aid. Since 2013, Emory alumni, friends, parents and others have donated more than $135 million toward Emory’s Scholarship Endowment Initiative, in some cases providing matching funds to encourage others to join the movement.